Today I love these loft conversions! What do you think of these kind of homes. I personally love them a lot. 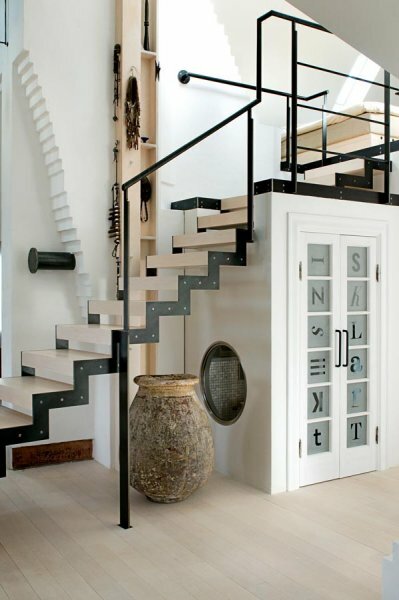 And especially the open character and the amazing floor space lofts mostly have. Although I love to call my own home my mini city loft it is not as spacious as the homes in this post. Or even better the big New York City lofts we know. But still... it has a real lofty and spacious feeling and I am completely happy with my home. If you would like to have a home with that same feeling and are living in a normal apartment like me. - My own apartment is about 25 years old now and is build in the times ceilings were only about 245 cm high and doors about 2 meter - I could highly recommend you, to not only take out the doors, but also the doorpost and thresholds. It instantly gives homes build in that same era an open feeling and some well needed daylight can flow easier through the rooms and hallway since then. Adding the same floor throughout the whole apartment also helps to get a spacious feeling. Happily enough I won the VT Wonen competition and got a whole new Loft floor just when I finished my kitchen renovation. I thought that name (and the color grey) really suited my home and my so called Masterplan. If you missed it here is the article with some cheesy pictures: My home in VT Wonen magazine I love the black wall and the black blinds in my kitchen but I would love to replace them by VELUX® windows that my nephews used in their holiday home, see them at the VELUX website. Although I did both - taking out the doorposts and adding the same floor throughout my whole apartment - I think that what makes my home feel most like a little city loft is the fact I took down some walls. Not only did I take down the wall between the former kitchen and a bedroom but also a little wall between the hallway and that same bedroom. And that really made a difference! 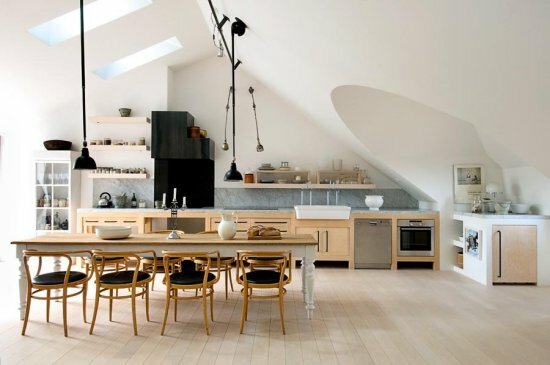 Here you can see some pictures of what I mean: Kitchen update | the masterplan The bare concrete walls (I have one in every room) also really help to give my home that particular loft feeling. If you do not have concrete walls you can add concrete wallpaper or maybe leave the bricks in sight. Despite the fact I have more light coming in, it still remains a ground floor apartment and I keep dreaming of a home with lots of sun and natural light. 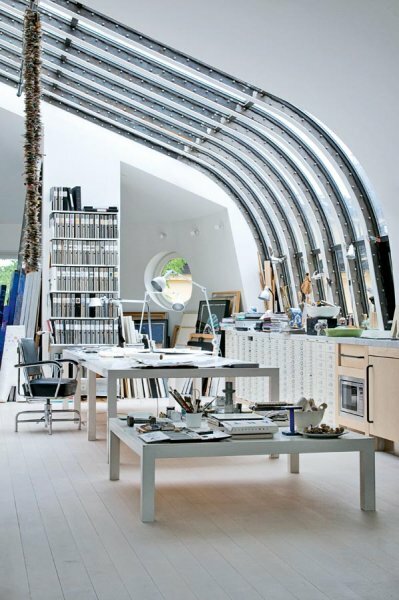 How amazing would it be to really live under the roof just like in this pictures.... and I wouldn't say no! to those amazing metal stairs that would bring me to the attic. Of course the whole upper floor would be just for sleeping and bathing. 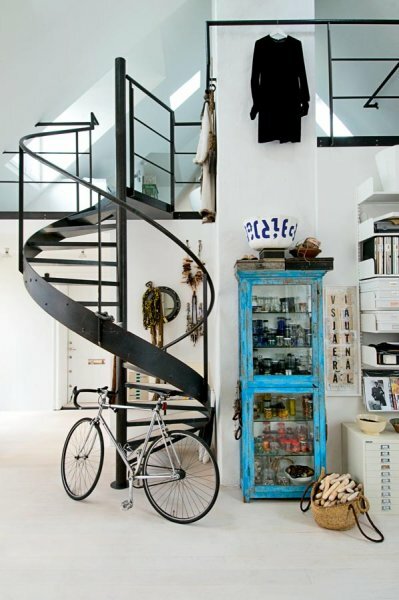 I mean it's a loft after all and an amazing big space. So why not living the good life! 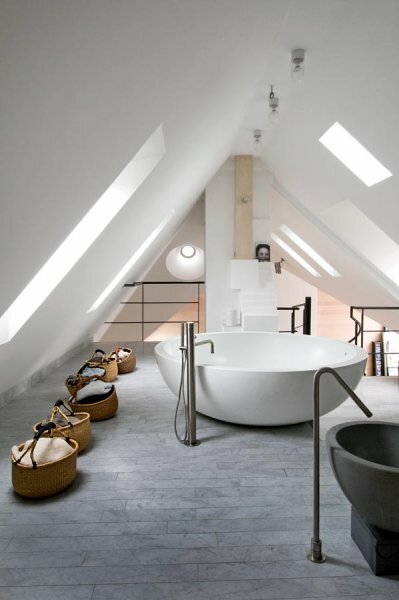 And don't we all just secretly dream of a bathroom like the one above with skylights to let in as much light as possible. In the daytime that is, at night I prefer to close my blinds. My nephews renovated the home of their mum on the French countryside and actually made an extra floor under the roof. I slept there for a week and they had, as I wrote, chosen for VELUX windows and I loved them, especially the remote control ;) Where do you dream off?